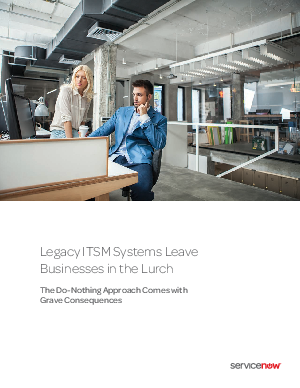 In the race for greater differentiation and innovation, Legacy ITSM systems are slowing businesses down in a big way. It’s becoming harder and harder for IT to serve the business with technology that is outdated, rigid and complex. Organizations intent on “getting by” aren’t doing the business any favors. In fact, the “do nothing” approach is putting the business at serious risk.